I met the poet, musician, and performer Sekou Sundiata in the winter of 2003, when the University of Michigan University Musical Society brought him to Ann Arbor to perform his autobiographical monologue, "blessing the boats." I was teaching a graduate seminar on public culture with Julie Ellison (founding Director of the national civic-engagement consortium, Imagining America: Artists and Scholars In Public Life, described here). Julie invited Sekou to speak about his work and about the public work of writing. The session was indelible, not only because of Sekou's attentive, charismatic teaching, but also because of a new poem that he read to the class. It reflected on the experience of being stuck in a stopped subway car in lower Manhattan in the months after 9/11, and on the fear and suspicion he felt. It was also the germ of the America Project, an exploration of American identity and power after 9/11 and of what Sekou called his "vexed" relationship to them. The project culminated in "the 51st (dream) state" (2006), a multi-media work of poetry, song, dance, and video. Sekou Sundiata developed The America Project and "the 51st (dream) state" through a series of residencies at academic and cultural institutions in partnership with their local communities. These included Lafayette College, Stanford University, the Walker Art Center in Minneapolis, the University of Massachusetts' New World Theatre, and his home institution, Eugene Lang College at The New School, where he taught an America Project seminar. The University of Michigan also hosted a residency in 2005, and Sekou's fortuitous appearance in our seminar led to his collaborating with my Arts of Citizenship Program and Julie Ellison's Imagining America consortium. A team of students in my undergraduate seminar, Community Projects In the Arts and Humanities (syllabus, 2005) organized the residency and its partnerships under Sedou's guidance. In fall, 2005, Julie Ellison's class, The Poetry of Everyday Life, served as a hosting partner for his visit. Sekou conceived the America Project to be at once civic and artistic; his creative process modeled what he called "the democracy of imagination." Early in a residency, he would convene academic, artistic, and community participants in a "community sing" or "poetry circle": they were asked to bring poems and songs that spoke to some aspect of American life or experience--and to start by singing or speaking someone else's offering. He would lead free-wheeling conversations about the issues that surfaced--patriotism, race, empire, war, family, popular culture--and then follow up with one-on-one dialogues, often videotaped, with selected participants. This process proved generative in the Michigan residency. Sekou worked closely with poets, writers, and activists in Detroit's vibrant Black Arts scene, including Melba Boyd and others. He also asked to engage voices from Dearborn's Arab-American community, the largest in the U.S.; and I connected him to leaders at ACCESS (the Arab Community Center For Economic and Social Services), with whom I had worked on a youth radio project in the year after 9/11 (described here). Julie Ellison's students designed and curated what they called "citizenship dinners," community events whose dramaturgy of food, dialogue, and relationship-building Sekou used in later residencies and visits. "the 51st (dream) state" was the distillation of these residencies and iterative collaborations. The spine of the 90-minute work was a cycle of poems, songs, and monologues, written and performed by Sekou Sundiata, interwoven with a score performed by a jazz ensemble. Looming behind the ensemble was a concave bank of scrims on which video, photographs, interviews, dance, and text were projected. (Among the featured interviewees were Ishmael Ahmed and Anan Ameri of ACCESS.) It must be added that this spare description cannot begin to capture the beauty and power of the spoken text, the songs, and the performance in toto. 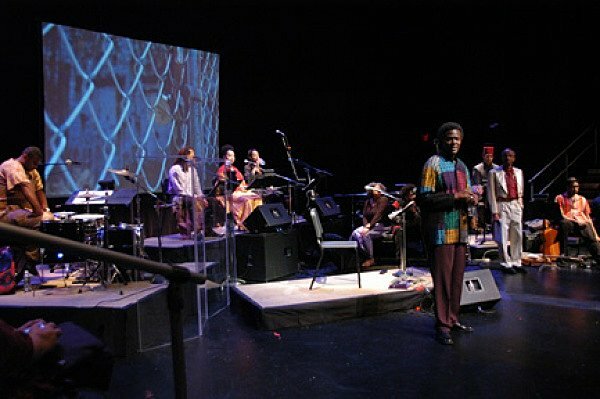 "the 51st (dream) state" premiered in 2006, with performances at the Brooklyn Academy of Music, the Walker Art Center, Stanford University, and other venues. It was presented in Ann Arbor by the University Musical Society in January, 2007. Eight months later, Sekou Sundiata died suddenly, the result of long-term health challenges he had narrated in "blessing the boats." His producers and long-time collaborators, MAPP International, continue to support both the performance piece itself and the America Project. They produced a documentary film about the project, "finding the 51st (dream) state," and published The America Project: A Teaching Method For Collaboration, Creativity, and Citizenship, a guide to Sekou's process and its further use. Their book, Blink Your Eyes: Sekou Sundiata Revisited, and this website offer a wonderful retrospective of Sekou's career and work. Equally important, the ongoing work of MAPP International supports engaged artists, public humanities programs, and educational and community activities that advance the democracy of imagination. You can view a video of "the 51st (dream) state," performed at the Brooklyn Academy of Music, here. (Many thanks to MAPP International for making this available.) I discuss the America Project and "the 51st (dream) state" as models for the democratic role of the humanities in my essay, "E Pluribus Plenum: Why We (the People) Need the Humanities."